A special Blue Jays coin commemorating 40 seasons of baseball in Canada is now for sale. “The Toronto Blue Jays have inspired generations of Torontonians and Canadians alike, from their inception in 1976, to their back-to-back World Series wins in 1992 and 1993, to their exhilarating season last year,” said Minister of Finance Bill Morneau. The Jays made it to the American League Championship Series in 2015 – losing to the Kansas City Royals in Game 6 – marking Hogtown’s first MLB post-season in 22 years. The new silver collector coin was released by Morneau, on behalf of the Royal Canadian Mint, at Rogers Centre Friday. “The support we’ve seen from fans across this country for the Blue Jays is incredible. We truly represent a nation,” said Jays’ VP of marketing and merchandise Anthony Partipilo. 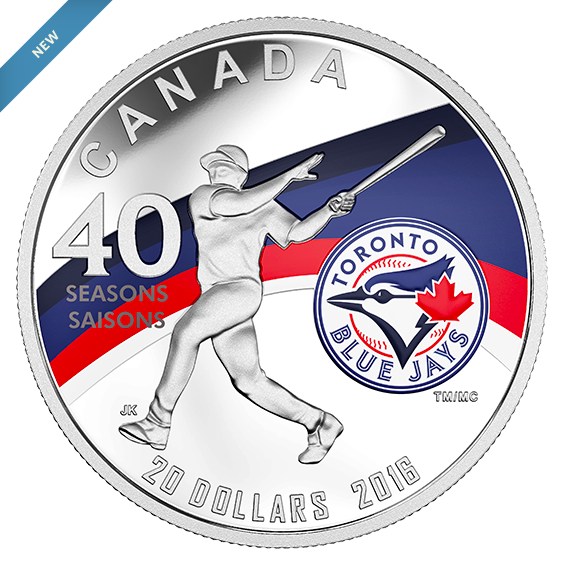 Designed by Canadian artist Joel Kimmel, the 99.99% pure silver coin features a red and blue wave, inspired by the team’s colours, flowing behind the silhouette of a player with the tell-tale stance of a home run hitter. Limited to a mintage of 40,000, the special coin retails for $99.95 CAD. The coin can be ordered by phoning the Mint at 1-800-267-1871 in Canada, 1-800-268-6468 in the US, or online. Jays Shop retail stores (Rogers Centre Gate 1 and 5; Toronto Eaton Centre). Royal Canadian Mint boutiques in Ottawa, Winnipeg and Vancouver. The Mint’s network of dealers and distributors, including participating Canada Post outlets.